At 888-LOG-GUYS, we are the #1 experts in log home restoration in the Lewisburg Tennessee area! We also are the experts in log home repair, log home chinking and caulking, log home improvement, and log home maintenance in the Lewisburg Tennessee area. You will be impressed with how far we are willing to go to make sure you are 100% satisfied with the look and condition of your log home or log cabin. You will save time and money using 888-LOG-GUYS as your log home care specialists. Call us today, or go to our website to request a free estimate! If it has been several years since your log home or log cabin was cleaned, your log home may need to be restored to get rid of the dark, weathered, or gray appearance you see on your logs. To make your log home look as good as new, we first strip the old stain with media blasting (corn cob, walnut, sand, or glass blasting) and then sand the logs before cleaning then with a borate treatment. 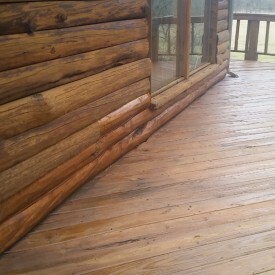 If an energy seal is needed, we would put that on next, and then finally, use the best stain product to give your log home the as-good-as-new look. If your log home or log cabin is in need of major repairs, 888-LOG-GUYS can fix your log home or log cabin back to excellent condition. If you have log rot, no problem! If you have holes dug by bugs, bees, or insects, no worries! If you have birds pecking at your logs, don’t stress! 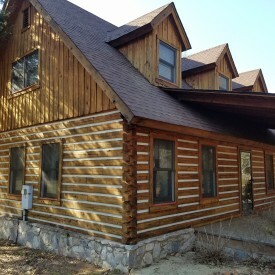 Our crew has repaired or replaced many feet of log and even replaced whole walls to fix log homes. No job is too big for 888-LOG-GUYS! Call us with your problem, and we will give you the best solution for your log home! If you have noticed gaps in between your logs, applying chinking or caulking to your log home or log cabin might be a wise decision. Our crew will apply an energy seal to your log home to keep out bugs and insects, air drafts, and water leaks. 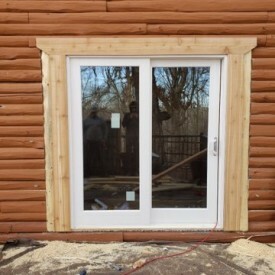 If you already have an energy seal on your log home but still have the same problems with invading bugs and insects, water leaks, and air drafts, then we can repair the old chinking or caulking to close those gaps that may have developed. Call us or ask for an estimate online to see how our log home experts can help you! If there is something you are wanting to add to your log home or log cabin in the Lewisburg TN area, then 888-LOG-GUYS are the guys to call to make your log home dreams a reality! Our estimator will discuss with you in detail what it is that you would like, and our crew will finish the project with absolute satisfaction. We can build log staircases or log railings. We can also construct decks, porches, and patios. If there is something else you had in mind, let us know how we can improve your log home! If your log home or log cabin is not properly maintained, you could be spending a lot more money trying to get it fixed when you should have used 888-LOG-GUYS for your log home care. We will always be there after the initial service to help you with the upkeep of your log home, and we will know what you need and when you need it. If you have questions about how to care for your home, give us a call, and we can tell you! You can also request to speak with an estimator from our website!